Now that we’ve determined which heat pipes can effectively carry the required heat load (Pt 1), we need to ensure we select and size the heat exchanger to dissipate the heat into the surrounding air -based on available air flow. As mentioned in the prior post, this article is not intended to provide detailed training/equations on the proper design of heat pipes and heat sinks, but rather to offer guidance on the number and size of heat pipes used as well as to provide some tips for estimating heat sink size and determining attachment methods of the sink to the PCB. 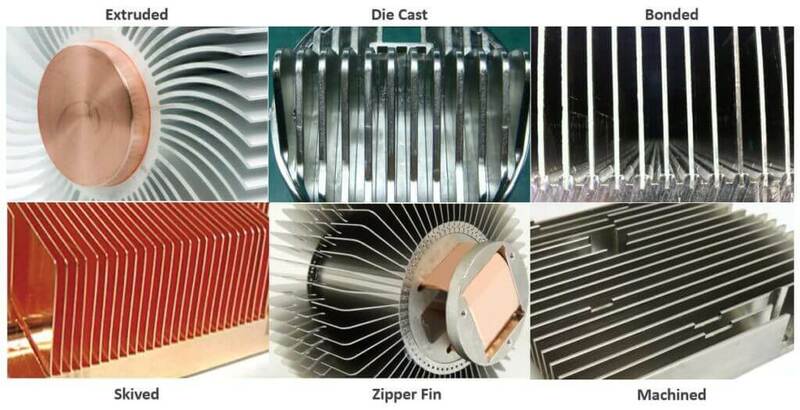 Types of Heat Sinks There are numerous choices from zipper pack fins to extruded fin stacks, each with their own cost and performance characteristics. While the heat sink choice can markedly affect heat dissipation performance, the biggest performance boost for any type of heat exchanger comes with forced convection. Estimating Required Heat Sink Volume By using the simple equation below, we can estimate the overall volume of the heat sink required to cool a heat source. V= (Q*Rv)/Delta T Volume is the outer dimensions of the heat sink. Q is power in watts and Rv is the volumetric thermal resistance (cm3-C/W). Table X provided some well established guidelines for the latter under different air flow rates. The first thing to notice is the enormous positive affect forced air has on thermal performance. Even with a gentle air flow, volumetric thermal resistance of the heat sink is reduced by two-thirds. Let’s say we have a 50W heat source (Q) who’s specified maximum operating junction temperature (Tjunction) is 100o C. Further, let’s assume we’re designing this device to operate in a max ambient temperature of 70o C – a rugged environment. By subtracting the ambient temperature from the maximum allowable electronics temperature, you arrive at the delta t: in this example it’s 100 – 70 = 30o C delta t. If we are designing a rugged computer, for instance, we’ll probably have a semi or fully sealed enclosure meaning that our heat sink needs to be designed for natural convection. The resulting heat sink volume would be: V = (50*500)/30= 833 cm3 = a really large heat sink of 9.4 x 9.4 x 9.4 cm. Obviously, we wouldn’t have a heat sink with 9.4 cm high fins in a natural convection environment so the length and width dimensions would have to grow substantially. But, we might surmise that this application would probably need to use the chassis lid as the heat sink. There’s an example of just such an application that I talked about in a prior post on ruggedized electronics and whose heat load, ambient operating temperature, and fanless design match the above example. Let’s look at just the lower half of the design. The bottom side of the PCB contains the processor and chipset at roughly 50W. A copper plate in conjunction with two heat pipes are used to spread and move heat to the chassis case, whose published dimensions are 25cm (L) X 15cm (W). We know the overall thickness of the assembled case is 7.5 cm and it looks to me the top and bottom lids are each roughly 2.5 cm thick. This would result in an overall volume of 938 cm3 which is within 15% of the required 833cm3 we calculated earlier. Had this same heat source been used in conjunction with forced air, the required heat sink volume would have been reduced by up to ten fold. 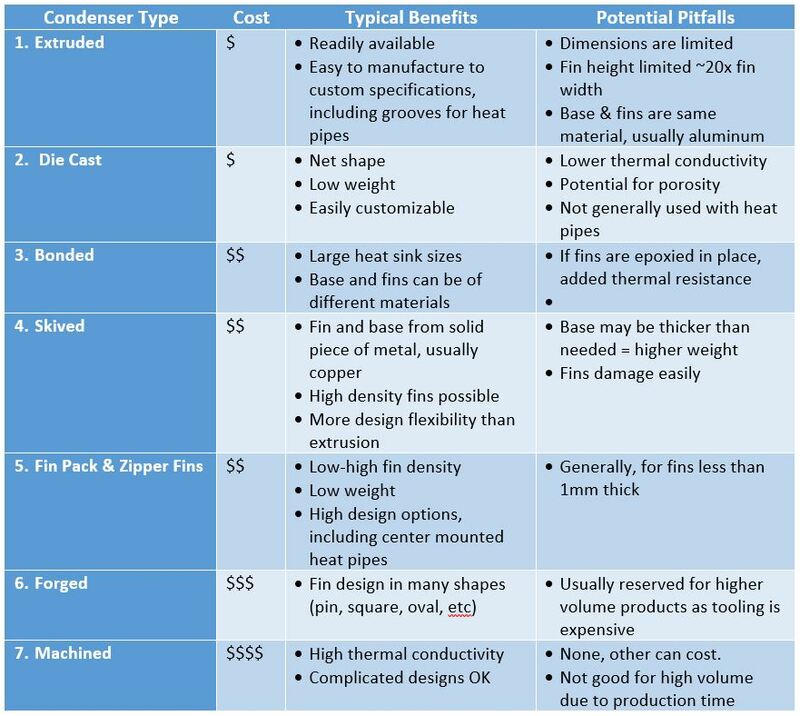 Although beyond the scope of this article, the next steps in heat sink design would be some detailed excel modeling followed by CFD analysis. This will enable engineers to fully understand optimal base thickness, fin pitch, fin height, and base/fin material among other things. Mating Heat Pipes to the Condenser Whether we’re dealing with a heat exchanger that is local or remote to the heat source, the options for mating a heat pipe(s) to them are identical. Grooved Base It should go without saying that simply soldering a round pipe to a flat surface is far from optimal. Circular or semi-circular grooves should be extruded or machined into the heat sink. It’s advisable to size the grooves about 0.1mm larger than the diameter of the heat pipe in order to allow enough room for the solder. The heat sink in Figure 2 uses both a local and remote heat sink. The extruded heat exchanger is design to accommodate slightly flattened heat pipes, helping to maximize the contact between the copper mounting plate and the heat source. A remote stamped fin pack is used to further increase thermal performance. These types of heat exchanger are particularly useful because the pipes can run directly through the center of the stack, decreasing conduction loss across the fin length. Because no base plate is required with this fin type, weight and cost can be reduced. Again the holes through which the heat pipes are mounted should be 0.1 mm larger than the pipe diameter. Had the pipe been completely round at the heat source, a thicker grooved mounting plate would have been required as seen in Figure 3. Direct Contact If conduction losses due to the base plate and extra TIM layer are still unacceptable, further flatting and machining of the heat pipes allows direct contact with the heat source as seen in Figure 4 above. Performance gains from this configuration usually lead to between a 2-8o C reduction in temperature rise. In cases where direct contact of the heat source to the heat pipes is required a vapor chamber, which can also be mounted directly, should be considered due to its improved heat spreading capacity. Attaching the Heat Sink to the Heat Source The primary reason for considering a heat pipe solution is improved performance. As such, I’m not going to talk about the use of thermal tape or epoxy as the primary means of attaching the heat sink to the die. We generally stick with one of several mechanical attachment methods where we can meet Mil or NEBS shock and vibe requirements. Additionally, the thermal resistance of thermal interface material (TIM) improves as pressure between the die and the heat sink is increased. 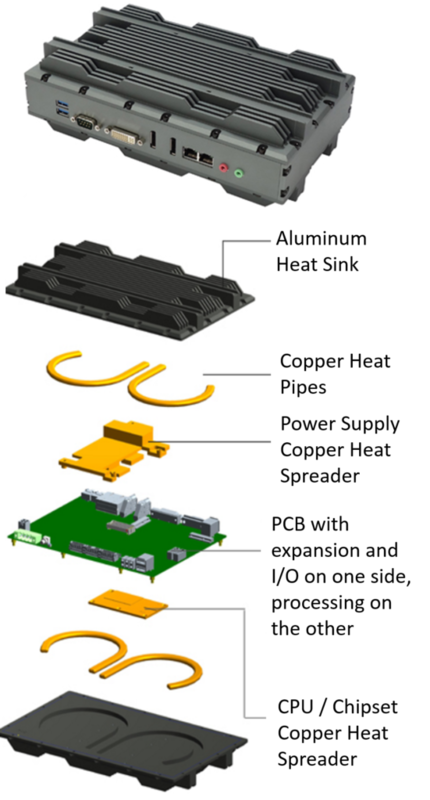 An inexpensive attachment method for small (low mass) heat sinks are stamped mounting plate. Although it requires two PCB holes, this method offers better shock and vibe protection thermal tape or epoxy and some TIM compression – although still only 5 PSI. Figure 6 shows spring loaded plastic or steel push pins further increase TIM compression up to around 10 PSI. Installation is fast and simple but removal requires access to the back of the PCB. Push pins should not be considered for anything more than light duty shock and vibe requirements. Spring loaded screws offer the highest degree of shock and vibe protection (Figure 7) as they are the most secure method of attaching a heat sink to the die and PCB. They offer the highest TIM preload at roughly 75 PSI and work very well with heavy heat sinks. About Celsia Celsia is a custom heat sink supplier specializing in heat pipe and vapor chamber thermal assemblies. We are a U.S. based company, with wholly-owned Taiwan manufacturing facilities, that prides itself on solving difficult cooling challenges under tight deadlines. Please contact us to schedule a thermal review of your next application.